Nostalgia's a funny thing, for sure, and it comes in all kinds of shapes and forms. 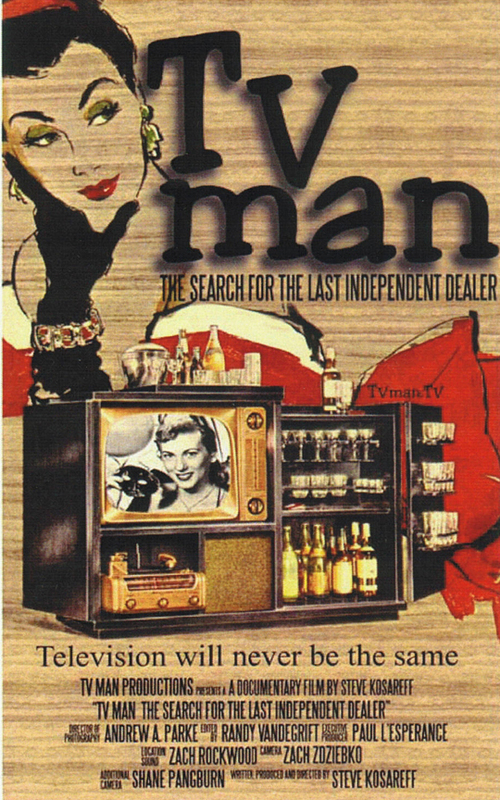 One look at the poster art for the new documentary TV MAN: THE SEARCH FOR THE LAST INDEPENDENT DEALER, and plenty of us who remember the early days of television will be immediately hooked. 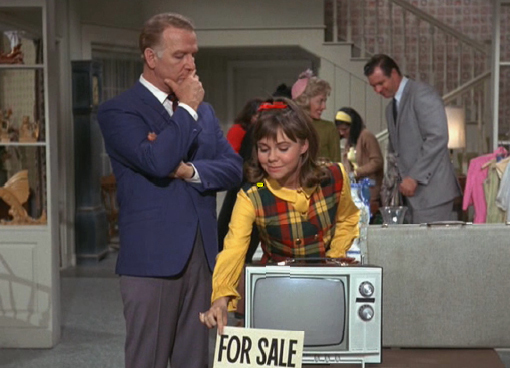 And yet the movie and the man who made it are interested in more than merely looking at or addressing early TV per se. Instead, Steve Kosareff and his oddball little film take a look at, first, some of the guys who sold -- and serviced -- those original TVs and then move on to the few remaining "independent dealers," mostly in the Pacific Northwest, who continue to do so -- at no little peril to their pocketbooks and, consequently, their lives. Mr. Kosareff (shown at right), who wrote, produced and directed this film -- his first -- is also said to be a TV expert and author of the book Window to the Future: The Golden Age of Television Marketing and Advertising. 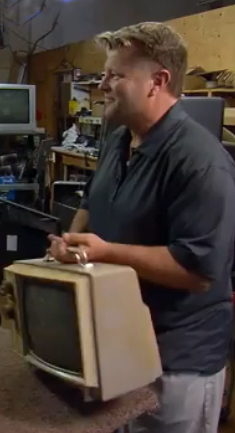 His ostensible reason for making this movie was to find a present-day dealer who could repair the first TV set he owned: a 12-inch black-and-white portable "Jetline" made by Zenith that Kosareff has his hand through the handle of, at right. The set no longer works, but for nostalgic reasons, he wants it to. 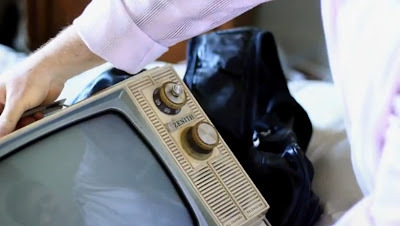 Clearly, he could not actually watch much of anything on it, since, these days, reception is received digitally and shown on wide-screen flat-screens. 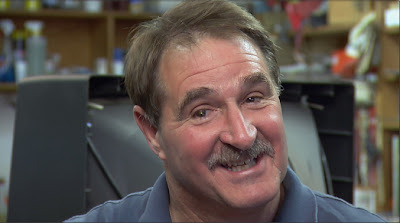 So bear with the filmmaker and his odyssey, please, because it very soon becomes a genuinely fascinating look at a few of the folk, shown above and below, who still run (or in some cases ran: We learn updates as the end credits roll) independent shops where televisions are sold and serviced. Service, in fact, is key to why most of them still survive. These people are fun, funny and sometimes unintentionally but beautifully moving, and Kosareff allows them to explain their lives as best they can, which is often quite well. 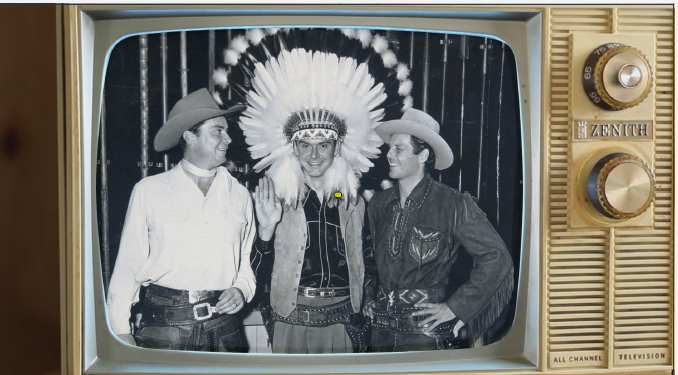 He also seeds his film with some wonderful archival footage, below, of some early television, and also of some early TV-set salesmen, like the guy in that American Indian headdress (so not-at-all politically correct for our day). We see everyone from comedian Jonathan Winters to early Sally Field (below), find out why women were so important to TV manufacturing (small hands! ), learn about how the barter system worked for early TV repair ("One day I came home with a load of pigs....") and so much more that's sweet, charming, nostalgic and, considering where we're headed, sometimes unbearably sad. 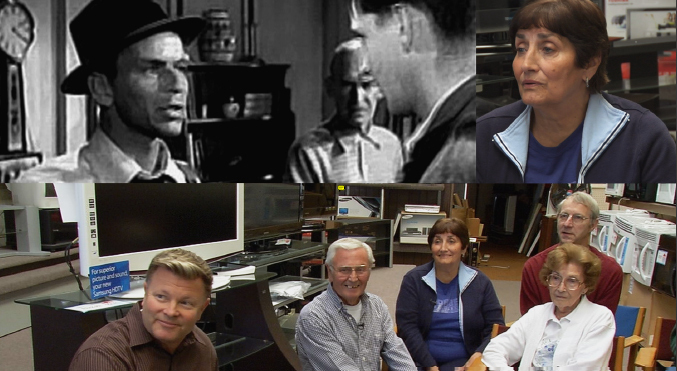 To hear these workers talk about their customers and their lives is something we don't get much of these days. The movie is a paean to small retailers, and some of you will wish that you could visit their stores, rather than walk into yet another Best Buy or Walmart. As a filmmaker, Kosareff is functional but occasionally surprises us with some treats: using that old TV "snow" to cut between scenes and offering us some wonderful old artwork from the 1950s where it seems that couples got dressed in their finest attire -- to sit down and watch their tiny little black-and-white TVs! He even has one set of dealers view clips (above) from the old Frank Sinatra thriller, Suddenly, that features a terrific little section all about a repairman and electrocution via TV! TV Man -- running 82 minutes -- turns out to be a rich combination of nostalgia and present-day concerns. It's unlike any other documentary out there, and so deserves to be seen, enjoyed and mulled over. It opens this Friday, September 6, in Los Angeles for a week's run at Laemmle's Monica 4. What about New York City? A film this good and this different ought to have a run here, too. So let's hope. If I discover another opening, here or elsewhere, I'll update this post to include it.